Last night the United States averted going over the Fiscal Cliff -- for now. It was a late night show down, where House Democrats passed with a minority of help from House Republicans a bill that addressed tax rates, extended unemployment insurance, and addressed a number of issues that included the price of milk and something to do with Puerto Rican rum. No one seems sure where that came in. It was a bill that was put together by Joe Biden and Mitch McConnell when no one else could get anything done. It's interesting that the Democrats passed a bill they didn't like, while House Republicans insisted that this is just the first of several cliffs yet to jump off. They seem ready to redo the disastrous 2011 fight over the Debt Limit, which the President doesn't want to deal with again. There will also be fights over resolving the Sequester cuts, that were designed to force Congress to deal with deficit reduction responsibly. Well, you know how these things go. After 17 months of dilly-dallying, we had to extend the debate for two more months. Then, in March, just in time for my birthday, we can fight again. These fights over the deficit and budget have an unfortunate consequence that goes beyond undermining a growing but still fragile economy. They get in the way of dealing with other important business that Congress needs to address. One of those issues is Immigration Reform. The other is Gun Safety Reform (Gun safety is the new term replacing gun control). Both of these issues are at the front of the President's mind and will get waylaid but budget fights. The other issue that will need addressing is the way in which the Affordable Care Act begins to be implemented. It appears that problematic loopholes are being discussed that need addressing. The ACA (Obamacare) was a necessary first step, but it created a less than perfect mechanism for insuring America's people. There are plenty of holes that could cause problems for both the nation and its people. If we could stop litigating the legislation and begin to address its problems we'd be in better shape. If there is any hopeful sign in all of this is the ability of Joe Biden and Mitch McConnell to forge a compromise piece of legislation. It appears that the President needs to send Joe out as his chief negotiator with Congress. He knows who to talk to and how to get things done. Experience does count! So, on this 2nd day of January, 2013 -- may we find a way to build bridges that benefit America's people and the people of this world, rather than dive off cliffs! 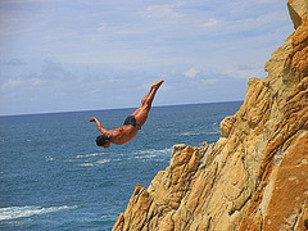 Cliff diving gives the diver a surge of adrenaline that after diving, they are wanting for more. For the amateurs however, they should first try assisted pool diving but make sure that no people around the pool are running. Back home in Tampa, such safety is ensured by installing of safety pool fence.